Does your dog get worked up by the sound of the doorbell or by other dogs walking past your home? Of course it would be absurd and cruel to try to stop your pooch from barking altogether, but you can train him to woof and shush on cue. Canines bark the most immediately after their owners leave home for the day. The easiest way to instantly reduce barking frequency is by feeding your pet using only hollow chew toys. Every evening, weigh and moisten your dog’s kibble or raw diet for the next day. Place the gooey chow inside the toys and leave them in the freezer overnight. In the morning, give your pet the frozen chew toys, and he will spend well over an hour extracting his breakfast. And if he’s occupied with the chew toys, he’ll be lying down quietly. If your dog is an excessive barker, do not leave him outdoors. 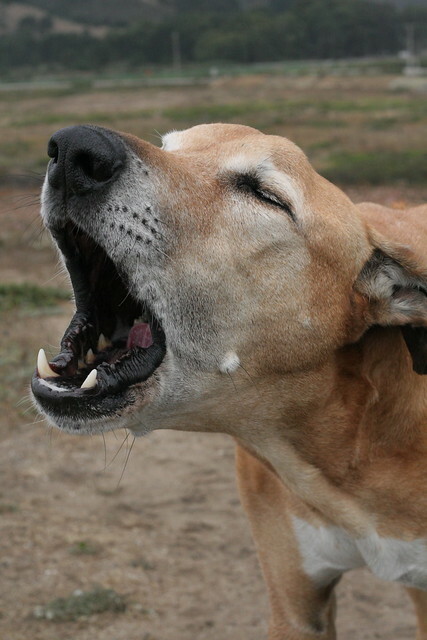 Dogs that stay in the yard are exposed to more distractions and their barks can disturb the neighbors more easily. Have your pet stay in a room away from the street with a radio playing to mask outside distractions. If you’ve been leaving your dog outside because he makes messes inside the house, toilet train and chew toy train him so he can enjoy indoor comforts while you’re away. It’s easier to teach your pooch to shush when he’s focused and calm; therefore, you should teach him to woof on cue first so he’s not barking uncontrollably when you’re trying to train him. Have an accomplice outside your front door. Say “woof” (or “speak”) to cue your assistant to ring the bell. Praise your pooch generously when he barks (due to the doorbell) and maybe even bark with him. After a few woofs, say “shush” and wag a treat in front of your pet’s nose to get him to stop barking. Praise your dog again as he sniffs the treat and give it to him. Repeat this process about a dozen times and your dog will learn to anticipate the doorbell when you ask him to speak. Similarly, he will learn to anticipate getting a treat after you tell him to be quiet. Soon he will be able to bark and shush on cue. Gradually increase the length of time between saying the shush command and offering the food reward. Two seconds, then five, then twelve, then twenty, and so on. Also alternate your instructions to woof and shush. Remember to always speak softly when telling your pooch to shush and reinforce his silence by whispering praise. The softer your voice is, the more inclined he will be to pay attention and listen to you. Previous Previous post: Should You Let Your Kid Walk The Dog?